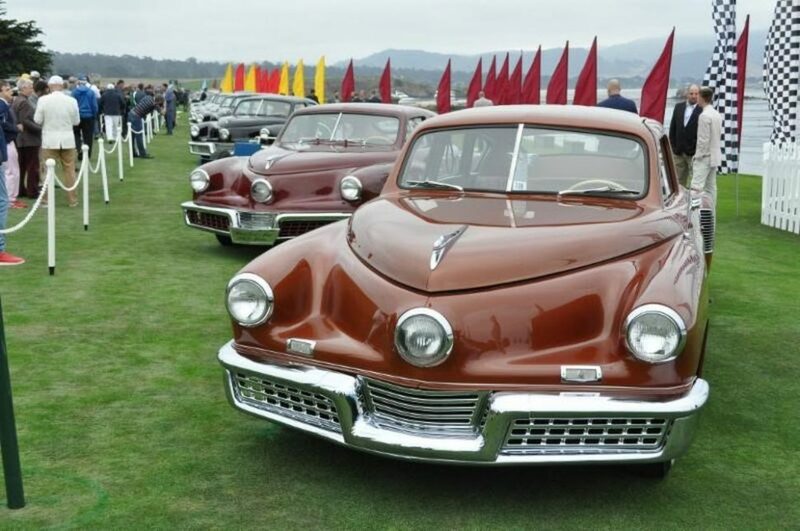 Tucker 48s on the lawn at Pebble Beach in 2018. Photo by Bill Rothermel, courtesy AACA Museum Inc. The AACA Museum Inc., in Hershey, Pennsylvania, is home to the largest collection of Tucker automobiles and artifacts in the world, housed in its Cammack Tucker Gallery. In January 2019, the museum presented the first in a series of lectures about Preston Tucker and his vision for the automobile of the future, featuring marque expert Mark Lieberman and John Tucker Jr., grandson of Preston Tucker. On Saturday, May 11, Lieberman and Tucker will return to the museum to speak on Tucker: The 50 Production Cars. Preston Tucker’s real ambition was to build “the car of tomorrow,” one not bound by the constraints of conventional automobiles of the day. His sedan placed the engine in the rear instead of the front, freeing up more cabin space for passengers. Decades before safety became a selling point, Tucker built his cars with a padded dash and doors, a pop-out windshield, and a reinforced survival cell for the front-seat passenger. Early plans called for seat belts and disc brakes, but both ideas were dropped prior to production. The “Tin Goose” prototype was shown to an expectant public in June 1947, though the car was not quite ready for prime time. Tucker’s in-house engine, a massive 589-cu.in. flat-six, briefly overheated, but not before stunning the crowd with the sheer volume of its exhaust note. The prototype lacked a reverse gear, a fact harped upon by newspaper columnist Drew Pearson, and other reviewers were equally unkind. By the time (limited) production began in 1948, the original Tucker engine had been dropped in favor of a Franklin O-335 335-cu.in. flat-six, which the automaker converted from air-cooling to liquid-cooling to better suit its adaptation from aircraft to automobile. In June 1948, Tucker purchased Air Cooled Motors, the engine’s manufacturer, ensuring an ongoing supply of engines, even if his supply of transmissions and steel was in doubt. That same month, the Securities and Exchange Commission (SEC) seized the files of the Tucker Corporation, in preparation for a criminal case it was building against Tucker and his closest associates. The move prompted Tucker to temporarily close his Chicago factory, laying off 2,200 workers after just 36 or 37 automobiles were assembled. In July 1948, Tucker brought back 300 of his most essential employees, and tasked them with one mission: Build as many Tucker automobiles as possible in the unknown amount of time remaining. Counting partially assembled Tucker 48s, that final number was 51, including the Tin Goose prototype (though today, two more Tucker 48s — chassis 1051 and 1052 — are generally recognized as “real” Tuckers, albeit ones with later production dates). Tucker refused to relent even as the SEC built its case against him. In September 1948, seven Tucker 48 models were driven from Chicago to Indianapolis for endurance testing at the Indianapolis Motor Speedway. Perhaps the most notable result was the crash of Tucker 1027, driven by chief engineer Eddied Offutt, who spun and then rolled the Tucker. Its pop-out windshield functioned as intended, and Offutt reportedly suffered nothing more than a bruised elbow. As for chassis 1027, it was righted, fitted with a new wheel and tire, then driven off under its own power. Preston Tucker was indicted in June 1949, and his trial lasted from October 1949 to January 1950. Though acquitted, the damage to Tucker’s reputation and business was irreversible, and later in 1950 the assets of the Tucker Corporation were sold at auction, closing the book on a particularly fascinating chapter in automotive history, and one that still draws interest today. Tucker: The 50 Production Cars will take an in-depth look at the running changes and variations seen throughout the 1948-’49 Tucker production run. Using archival photos and contemporary images, Lieberman and Tucker will discuss the evolution of Tucker assembly, aided by the Tucker 48s (chassis 1001, 1022, and 1026) in the Cammack Tucker Gallery. The presentation runs from 2:00 to 3:00 p.m. in the Regions & Chapters Room, and will be followed by a question-and-answer session from 3:00 to 3:30 p.m. Each Tucker-centered discussion is a stand-alone event, so attendance at prior sessions is not required. The program is free for all Tucker Automobile Club of America members, or is priced at $5.00 per ticket for existing museum members and $17.50 (which includes adult admission) for non-members. Space is limited to 50 attendees, so those interested can register at this link. For additional information, visit AACAMuseum.org/events.